The Replay & Sons SS18 collection draws inspiration from the adult range, and includes three different themes for both boys and girls. BLACK HOLIDAY. A gritty, minimal look, in which black denim, either clean-lined or biker-style, combines perfectly with jackets in denim and leather. Outfits are finished off with sweatshirts and T-shirts, some garment dyed, others printed using innovative techniques. Touches of red, royal blue and fluo yellow complete the whites and blacks. MILITARY SURFER. Surf-style apparel, oversized shirts and camouflage parkas, proposed in shades of green, and played down with contrasting patches and writing. For the littlest boys, the might of a military style is made more playful thanks to the energy of coloured prints and cute Hawaiian motifs. DENIM. SS18 DENIM is the perfect complement for colourful T-shirts, sweatshirts and bomber jackets with 80s-inspired graphic decorations. A basic world featuring clean, essential lines, in which the predominant colours are white and every conceivable shade of blue. Constant research into fabrics, innovative washes and a careful eye to fit all go to ensure absolute comfort and practicality for little people. Clean-lined garments are accompanied with patches, abrasions, creasing, tears and darning to give denim a used look. The fits available are: slim, super slim, regular slim, slim low crotch and straight. BLACK HOLIDAY. The black satin bomber jacket is the must-have of this world, combined with black denim and a plain T-shirt, or one decorated with glitter printing, embroidery and sequins. The black lace dress and long skirt are for the littlest rock chicks. Splashes of red break up the alternating blacks and whites. MILITARY SURFER. Here the undisputed stars are cargo pants, proposed in military green and camouflage versions, to be worn with other military-style apparel such as the shirt and jacket, played down with raised glitter writing or romantic flounces around the bottom. Combine the military proposals with the lace dress or floral-print skirt for a range of original looks. THE BURNING MAN. The third mood draws its inspiration from the most famous of desert music festivals. A glamorous desert style, with shades of pink alongside pale or white denim. Fabrics are soft and light, and garments feature fading and delicately nuanced colours. 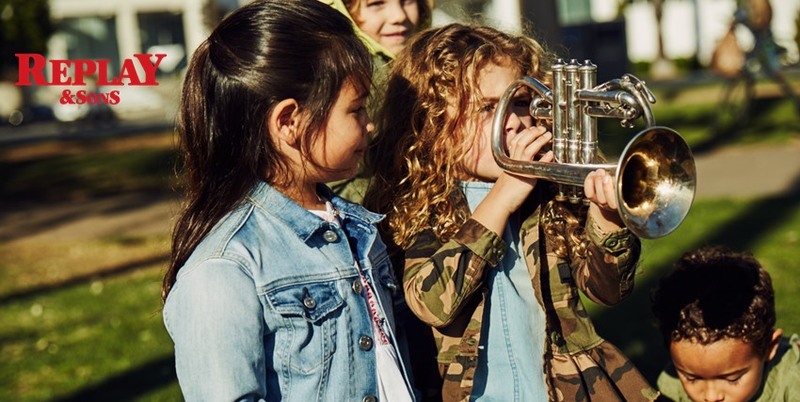 The DENIM line is unmissable even for the littlest girls, with proposals ideal for pairing up with T-shirts and sweatshirts featuring embroidery and sequins or prints with rhinestones. The predominant colours for denim are white and all shades of blue, from pale to dark, plus pastel colours. Eight different trouser fits are completed with jackets, shirts, dresses and denim dungarees.